As a little girl one of my favorite places in Granny's house was her kitchen. The sink was just beneath the window and had two sides; one for washing and one for rinsing. Just outside the window was her beautiful green lawn, flower beds, and large garden which ran all along the fence line. 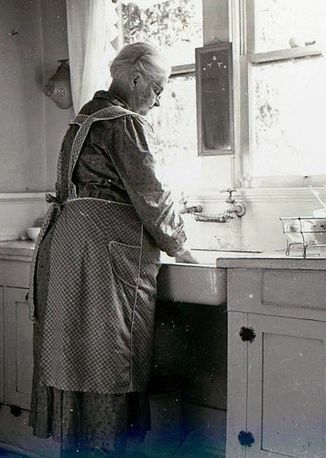 We were the dishwashers back in the day and looking out the window while washing and rinsing the dishes was calming, it was actually enjoyable washing dishes in Granny's kitchen. Surely this special place was more about spending time with Granny than the location of the sink, but the view from the window while washing things up sure was nice. My mother's kitchen window is still a favorite spot of mine. Though she does have an automatic dishwasher there are many times we wash things up in the kitchen sink. Mom's kitchen window is always a bright and sunny spot. The sun streams in while we are hand washing and magical colors form as the sun's rays dance on the sudsy bubbles. And as we rinse those colorful bubbles away the dishes just glisten, sparkly clean as the sunlight dances on the rinse water dripping from the dinner plates and glasses. Surely this favorite spot also has more to do with begin alongside my mom, but the bright and sunny window sure adds a special something. and it has finally been installed! 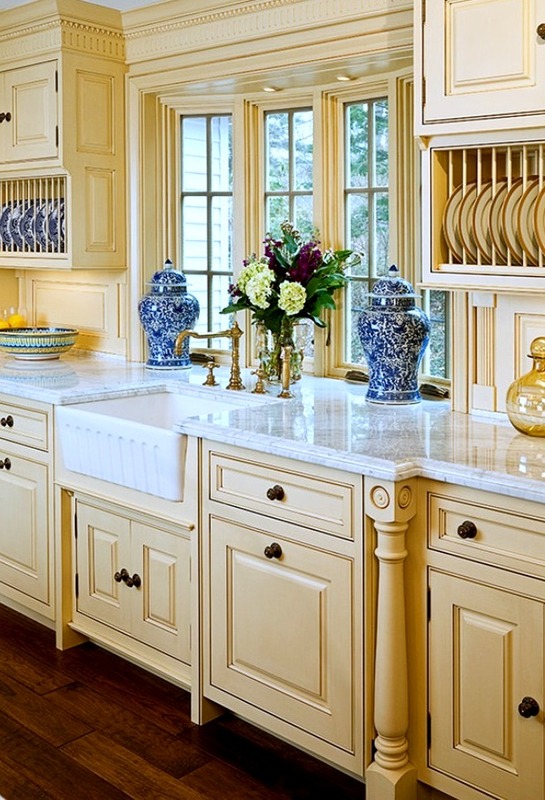 These pictures were my inspiration when choosing a window for the new kitchen. 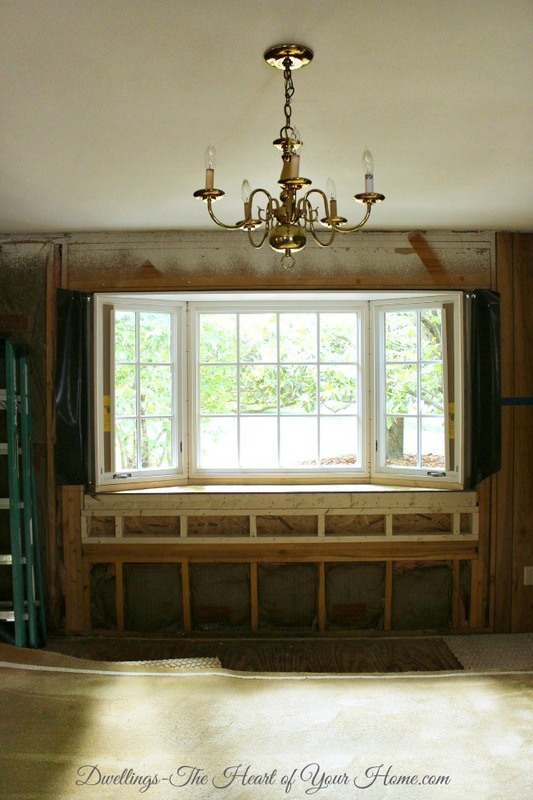 The new window has been installed. 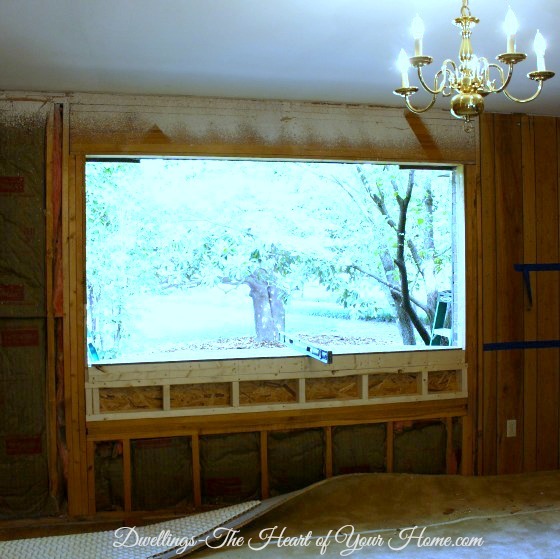 These pictures aren't all that pretty but with remodeling it always gets messy before it gets pretty. The new one is being framed in. We have one coat of primer on the window. Still need to add the final trim work, caulk, and paint. One more thing checked off the remodel list but it doesn't seem like we are any closer to being finished. Our contractor says it will more than likely be September...BIG sigh! and my hope is that it will also become a special place for others. will stand alongside me at the sink just beneath my kitchen window. 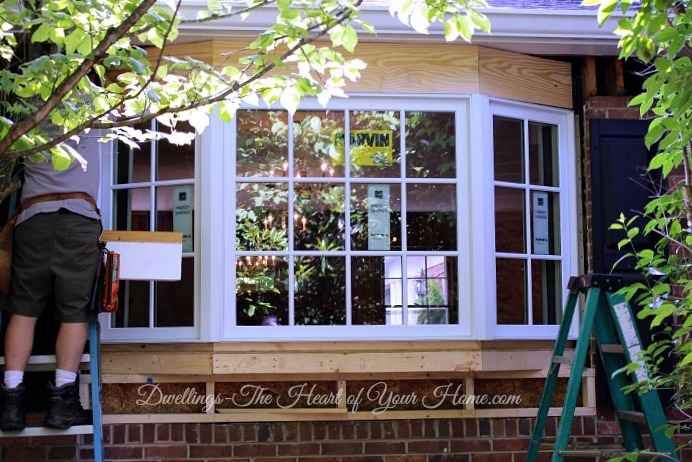 I really like the look of the bay window with extended counter. I don't think I've ever noticed it before on any kitchen inspiration photos so I'm glad you posted about it. What a great idea! Looking forward to seeing the kitchen when it's done. It's going to be gorgeous Cindy! Oh, Cindy - it's AWESOME! What a huge improvement.....watching this transformation is pure joy. I am so so happy for you! Keep up the good work......it is going to be worth your wait! 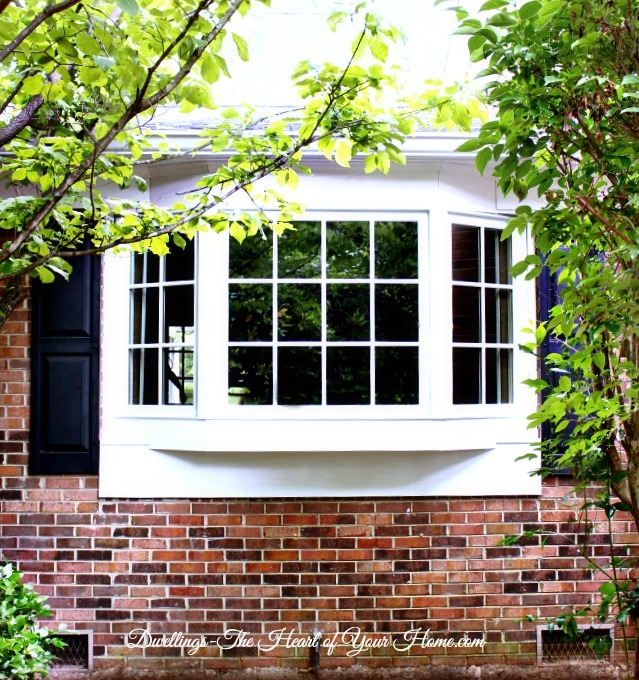 Beautiful window Cindy...I love all your inspiration photos! It's going to be gorgeous just like your inspiration photos! You are so right about memories being tied to the kitchen sink. Even now, even after my mother's home was passed to my son and he's remodeled, the sink stayed underneath the window and I can't stand there without thinking of her and childhood. During canning season, it was my job to wash the jars because my hand was small enough to go inside the mouth of the jar. My sisters and I talked and laughed while washing and drying growing up and during back home visits. Oh, to recall those days again. At the time you give no thought to how precious they are. 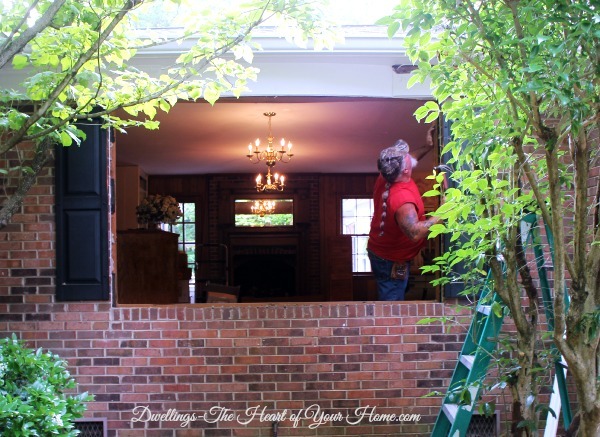 Your new window is going to be beautiful and you'll make new memories to pass on. September will be here before you now it. How beautiful, Cindy! 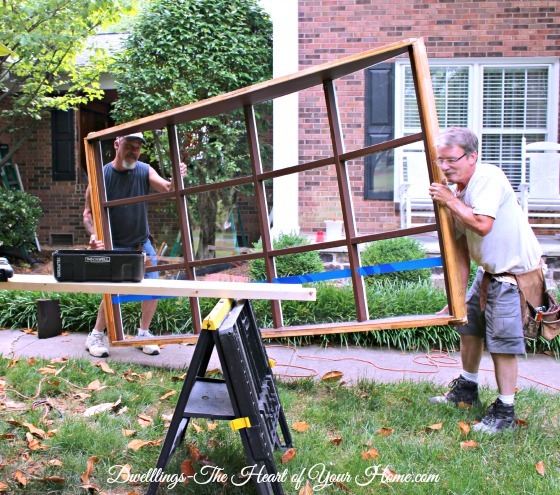 We had a bay window like that in our last home...sure do miss it! You are going to enjoy being able to decorate that lovely space! 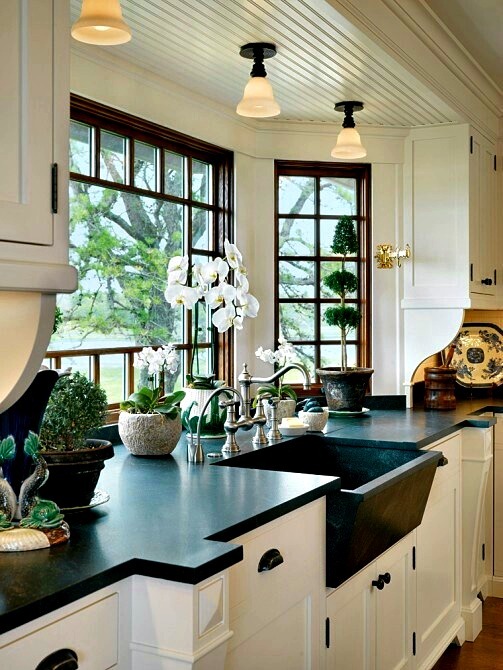 I am dying over that first kitchen with the black countertops, sink and windows!! Can't wait to see what you come up with! Beautiful, Cindy! I would really miss my kitchen window if I didn't have it. Reading about your memories of looking out your granny's kitchen sparked my own memories of when I was little. It was at the kitchen sink where my sisters and I would sing together as we did the dishes, looking out into the front yard where the huge willow tree grew. Looking forward to keeping up with the progress! Your kitchen is coming right along and it is going to be lovely! My current house doesn't have a window over the sink but I have a mirror there to reflect the view behind me when I'm washing dishes. I'm hoping to have a sink with a window when we move. It's fun to watch the progress over at your place! LOVE IT!!! 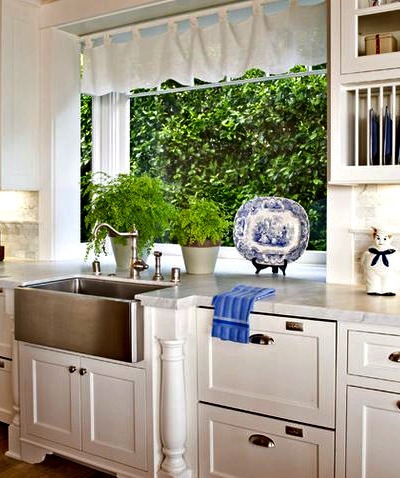 I am a big fan of a window over the kitchen sink too. Maybe because I spent a lot of time washing dishes and looking out at my grandmothers farmhouse. I have a window over mine, but it's nothing like your huge window, you are going to love yours for sure. It looks wonderful already! I can envision it now! Fabulous! I have a little window, but with a 5' from the property line view of a fence. My husband planted a snowball which has now gotten huge, and we added some trellis on the outside of the window. So instead of a view of a landscape, I kind of feel like I am looking into a garden, and that's not too bad. Your new window is going to bring you a lot of pleasure, I am sure. Perhaps someone will make memories of washing dishes with you, too. SO pretty! I can not wait to see how you decorate it! Thank you for showing all of these photographs. My husband and I are thinking of building a new house and I love this idea. I have always had a window over my kitchen sink, but the plans in the houses we are considering do not. I might have to re-think!! Cannot wait to see the finish project!! OH it's going to be fabulous Cindy!! I l love it! Be patient. The new kitchen will be worth it in the end. When you get down from all the construction, look out your big beautiful window! Beautiful window and I loved your inspiration windows too, you will love standing there doing dishes and looking out the window! Your new window is gorgeous. 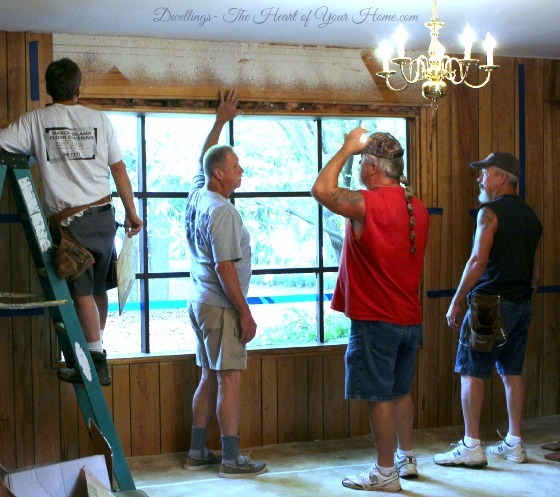 What did you do with the old window? I am picturing a chalkboard behind it or just using it for vignettes - BIG vignettes. I can't wait to see the finished kitchen! Found this on Pinterest, so am guessing your kitchen is all done by now, LOL! I will come over and look through your blog. I wish I could go back to all of the houses I have lived at and take a picture out of the kitchen window!